It seems whenever Friday afternoon rolls around I become nostalgic in a way, for the way things were before I had my own family and the weekend loomed like a glittering jewel before me. A good part of my single life, I held 2 jobs - and there were plenty of weekends spent working I'm sure, but in retrospect I had this miraculous thing called "free time" which seems to come with alarming infrequency lately. 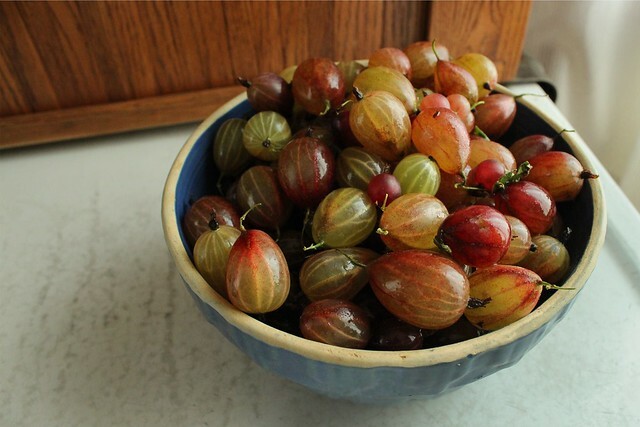 Sunday afternoon, I got a couple of pounds of gooseberries from Klee's. I made the time to work them into jam right away Monday morning since they were pink and soft. They were mixed varieties, that when commingled with sugar transformed into a singular flavor that I still can't describe. They are tropical I swear, a Midwestern answer to passionfruit. My little tester jar of gooseberry jam the other week told me I should stop shy of the 220 degree gel point, so I boiled to 118 degrees and was rewarded with a softer set. I'm going to write down the recipe, since it bears remembering my process. Gooseberries are naturally high in acid. Green gooseberries higher of course than those that are picked and allowed to blush - but with the blush their tartness mellows just a bit and makes a "prettier" finished preserve. There really aren't a whole lot of gooseberry jam recipes out there I noticed in my digging. Even the county extension website was vague (and why don't those conventional sources use weights?? This plagues me: I am a scaling addict.). To be extra "safe", I added the juice of a half lemon. There is definitely enough natural pectin that you should never dream of using a box of liquid or powder. Combine the gooseberries and water in a large preserving pot and smash casually with a masher to crush most of the gooseberries. Heat over medium heat and cook until the gooseberries break down a little, about 10 minutes. Then add the sugar and lemon juice, increase the heat to medium high and continue cooking, stirring regularly, until you reach your desired firmness - about 118 degrees as I mentioned above. 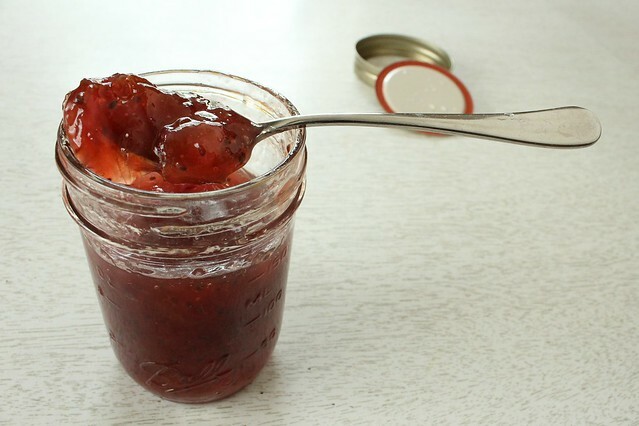 You'll feel the thickness of the jam increase as you stir, and the jam should sheet nicely off the spoon you are stirring with. When the jam is ready, pour into sterilized jars, top with lids and rings, and process in a boiling water bath for 10 minutes. This week, I also did pickles. My mother-in-law wanted a dozen jars and bought me a half bushel of cucumbers at the farmer's market on Tuesday. By Tuesday evening, I had done 22 quarts (losing one to a broken jar). 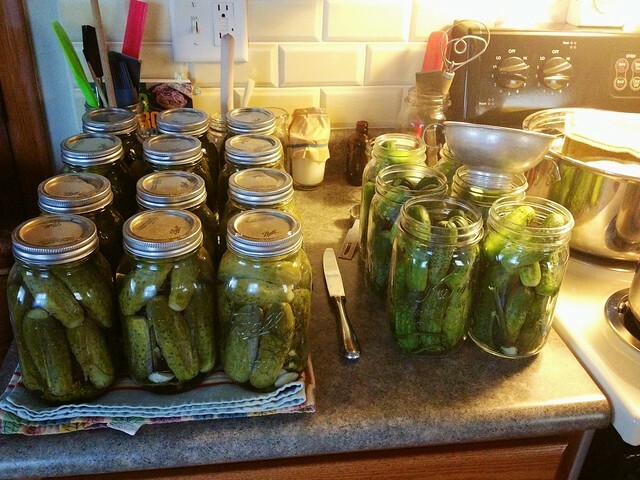 I used my Gram's pickle recipe, misjudging the amount of brine I'd need two times, causing me to pause and make more. That worked out all right, especially with a new baby walker anxious to try out his new skills at my feet in the kitchen. Maybe I'll always associate his first steps with a mountain of pickles; that's kind of a nice thing. 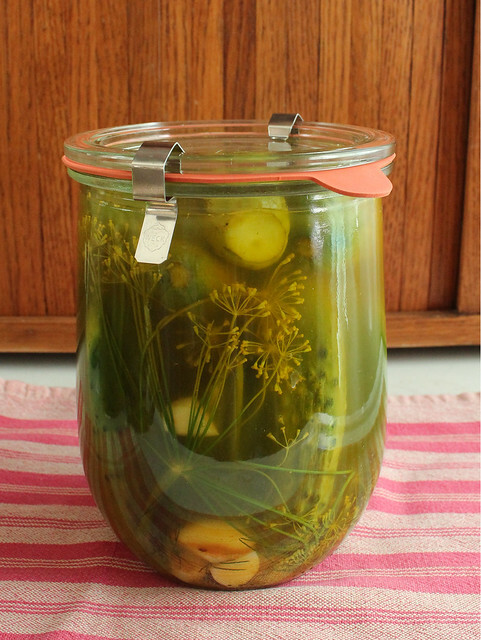 This recipe is the only pickle that tastes like a real dill pickle to me. The recipe is in my book! By late evening, I had the pickles mostly done. I had about 5 pounds of cucumbers remaining and I was too tired to think about more pickles. They sat for 2 days in the fridge before I put them to their final rest in jars. I tried two kinds of refrigerator pickles that I'd not made before. The first were these turmeric spiked whole dills that Ivy recommended. I used the recipe as a template, since I was low on fresh dill. I used Spice House pickling spice and extra dill seed. I used Bragg's cider vinegar even though I "killed" it by heating it to a boil. I love the taste of Bragg's so much that any other vinegar doesn't taste like vinegar to me. A half recipe of the brine filled two quart sized jars just fine. I sliced the remaining pickles to 1/8 inch on my mandoline and made a big jar of refrigerator pickles. I got the recipe from my Parents, who had gotten it from someone in the '90's. I remember the plastic pail of bread and butter pickles as being too sweet and kind of flabby, not really my favorite things 20 years ago. But I modified the recipe and so far I think they are one of my favorite pickles ever! In part, because I left out all traces of celery seed. There aren't many things I dislike, but I've come to the realization that celery seed is kind of one of them. I can't seem to keep my fork out of this jar. After 2 days, the cukes are still pretty crisp. I kind of winged the recipe, making just 1/4 of the brine (which was simply equal parts sugar and white vinegar, with the addition of 1 tablespoon of kosher salt), and adding a half onion and extra brown mustard seed. This recipe is so quick, just mix everything and pack it into a jar. I'll give the proportions for a whole batch - but keep in mind it's pretty forgiving. 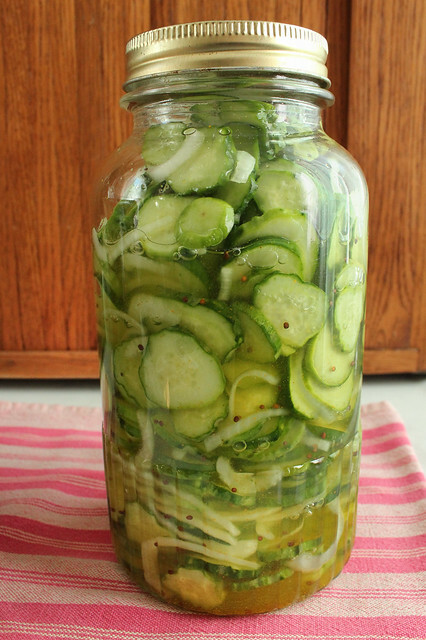 The cukes give off their own liquid when allowed to rest in the salted vinegar brine, so after a few more hours the jar above was completely filled with liquid. Part of the reason I might have a new-found love for these bread & butters is that I've been making single cucumber batches of James Peterson's Thai Cucumber Salad with Peanuts from his Kitchen Simple cookbook. I am a voracious reader of cookbooks, and I think one of my favorite authors is James Peterson. His books seem like friends to me, and the Kitchen Simple book in particular has become my trusted ally in quick summery eating. His salad has equal parts sugar and rice wine vinegar (the unseasoned kind), some chile peppers and plenty of cilantro. It's so good. I'd imagine I could do up a quart similar to the bread and butters and munch on them for a month or so and I might just have to get more cukes to do that. So what do I, "unemployed" for some 8 years already, do on a Friday evening now? Afternoon has come and gone since I started writing this, and a spanakopita of sorts is just about to come from the oven, concocted of fresh chard and kale and some frozen spinach unearthed from the freezer. The new baby walker opted out of a nap to practice his craft and is already asleep at 6 pm. The window are flung wide open with the coolness of our most excellent summer weather ever. I don't feel the pangs of sadness I once did that I don't do anything exciting come Friday night, instead I take pleasure in the hard work of the week and get ready for a country visit so I can hopefully bring some more work home with me. It's really the best kind of life.